Discussion in 'Mikrokopter' started by espariz, Sep 1, 2009. Es un modem inalámbrico en 900Mhz que, poniendo uno en el MK y otro unido al USB de nuestro portatil, permite hacer lo mismo que hacemos con el Bluetooth a distancia (configuración de parámetros, establecer Waypoints, y sobre todo, aparece la vista 3D en tiempor real del MK y la pantalla de OSD con altura, voltaje de la batería, mapa, etc etc), pero con 1,6 KILOMETROS de alcance. This project developed in co-operation with Gregor (killagreg) from the MikroKopter forum. Gregor and I are beta testers with H&I for the MikroKopterprojekt. Does a radio transmission if as RS232 replacement the BTM-222 module prima function why now? The Bluetoothmodul sends on 2400 MHz or 2.4 GHz, which are the frequency on at many people the video transmission circuit run. Ever more model flier have also 2.4 GHz a remote control in the employment, goes everything, but by the short distances send and receiving antennas can it to impairments lead. The next point is the range, a Bluetoothverbindung bridged with the 6cm wire antenna approx. 300 to 400m. Those does not transmit-strain creates with a 8cm is enough for wire antenna approx. 1.6 km and it gives disturbances in the WLAN, video and remote control range. The radio solution is however more expensive than the BT-solution. The RK-Wi.232EUR-R module of the company Radiotronix used here costs alone already approx. 35 EUR plus 6,50 EUR postage. With the rising dollar rates - tendency rising. We use here the European 868-870MHz volume version with 32mW power output. Wi.232FHSS-250-R North America version with 250mW transmitting power for up to 40KM!!! Note: The DTS version for US market seems to make problems in connection with a GPS receiver. Well, we do not use those. 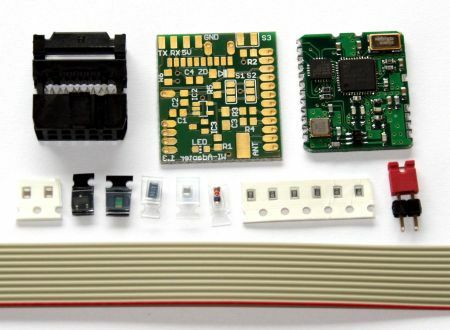 The Wi.232 module belongs to the Famile of the WiSE™ (Wireless Serial engine) modules. over a transparent UART ton antenna wireless solution to make possible and serves RS-232/422/485 applications as cable replacement in all embedded. With simple words: Everywhere where a serial interwiring is needed, the Wi.232 module can make this connection over radio. Application does not notice whether the connection by a cable or wirelessly via air is made. There is possible for POINT ton of POINT or POINT ton of multipoint links. The modules can work in groups. A 7bit group ID can be assigned to each module. All modules on the same channel to work can kummunizieren among themselves. The modules can be operated also in two network mode: Master/Slave and Peer ton Peer. In this mode defines a set of Kummunikationsregeln, which modules may speak among themselves. To the master/Slave mode can contact the master Slaves or other Mastern. Slaves can contact other Mastern, but not to Slaves. Dierser mode is used in RS-485 network. In peer ton peer mode can manufacture each module connection to each module. In both modes however the same group ID must be adjusted. If a module sends a package, all modules on the same channel receive this signal, examine the package for errors and examine whether the group ID are suitable. If the package is error free and the group ID fits, the module decodes the package and sends the error free data to the UART. Most features of the module are adjustable via programmable registers. The registers can be read and described if the COMMAND pin (CMD) low are. If CMD lies on high, all data are sent transparently over radio. With a RESET contents of the Flashspeichers are loaded into RAM. The modules always work with the Inalt RAM of the register. Programs which the registers module often change, should the RAM contents change. By the placing the default attitudes in the Flash, the modules always start with valid values. That is for applications importantly, simply only the data transferred wants however not in the situation is register contents to be changed. The UART interface transfers 115,2 into full duplex with Baud guesses/advises from 2.4 tons kbps. The module has 10 power modes: 4 wideband modes, 4 narrowband modes, standby, and sleep. In wideband the mode the module has a range of 600kHz. In this mode it can work on 2 channels and brings it on maximum a RF DATA guesses/advises from 76.8kbit/second. In narrowband the mode the Banbreite on 200kHz is limited. In this mode the module on 6 channels can work and supported up to 9600 Baud. The module can be shifted by command into a Sleepmodus, that HF-MODULE is switched off and the processor into a waiting status set, the power input goes then against zero. protocol over to determine whether another module sends straight. If another module should send, this transmission is received and the package thereafter is sent. The long expected supply of the first 6 modules arrived. The front of the Wi.232EUR-Basisplatine. On the left of the Konfigurationsjumper, it is needed only for programming or a hard RESET. +5V, GND, RxD and TxD occupy. The TX/RX level is 5V, thus TTL compatibly. among them the basis plate finds. The module is soldered head over on the basis plate. Which first like a Design error looked, emerged then as ideal HF-screen. The L/4-Antenne is a 8.6cm longer wire-cavorts. Around the Wi.232EUR-Basisplatine problem-free with the MikroKopter a pole will connect 10. Flat strip cable with 10 a pole. Post plug uses. The appropriate Lötpads is present. Simply to the NaviCtrl or Flight CTRL attach - completely. The voltage supply of the module is made directly by the flat strip cable. Alternatively one can do also the 4 pole. Pin row use. (I make) The connection of the Wi.232EUR-Basisplatine to the PC takes place with the USB ton TTL RS232 converter module. Attach simply the radio module to the converter. Voltage supply and the serial Verbing to the PC are manufactured thereby. For configuration the Radiotronix configuration program, which Jumper attach, the Baud rate and the appropriate interface start adjust. Configure, the Jumper remove, afterwards the Wi.232EUR separate. Finished. Attach the Wi.232EUR-Modul for further use with the MikroKopter the USB ton TTL RS232 converter module. On the MK naturally also a Wi.232EUR-Funkmodul must be inserted. Select the appropriate serial interface in the Koptertool. Again finished. Now the parameters can be observed, stored and read the Settings and the MK plates also bottles in the Koptertool. If the Parametrieren should not function, you ran into the “RTS/CTS case” and do not use not the USB ton TTL RS232 converter module. Thus it folds guaranteed. Radiotronix makes an extensive configuration program available for its modules. The “Wi.232EUR evaluation software” permits extensive changes at the modes of operation of the radio module. Left contents RAM of the register are represented. This picture shows contents of the Flash of register, the changes made here is effective with the next start of the module. Changes please with consideration make. The board layout of the double-sided basis plate. The pin row for the Programmierjumper is also not equipped more. One can short circuit the two Lötpads with tweezers for the short time of programming. The bill of material for the current modules. If the modules are once parametriert, it is enough to supply them simply with tension. The connection between the modules is made automatically. One can data immediately transmit and must about nothing further worry. Thereby also the plates NaviCtrl, FlightCtrl and the MK3Mag with the Koptertool bottles can natural be parametrieren and. In the next execution of the Koptertools with googleEarth support one can send waypoints by Click on the notebook to the Kopter. These waypoints are then flown off when desired. New waypoints can be loaded also during the flight. Momentarily runs an inquiry with googles around the legal situation to clarify. A very interesting application develops straight in the MikroKopterforum a “FollowMe” plate mentioned is developed left there. Thus it is to be sent among other things possible the position of the ground position at the MikroKopter, so that this follows the ground station. Or one can send waypoints to the MikroKopter, which are then flown off. The technical possibilities of the FollowMe plate daily extended, simply times to clean-look. For the connection between ground station and MikroKopter the Wi.232EUR-R-Funkmodul with all its advantages is naturally used. Meanwhile the radio modules function also outstanding on the Arm o Kopter. There was a problem with the necessary tension stroke for the arm processor. If that is reduced 1K resistance R5 to 100 ohms, the voltage increase is sufficiently high. This change has also no disadvantages for other applications. The data communication with the radio module Wi.232EUR-R is not functioned however perfect surely the cheapest solution, over a large distance. Who would like to have it more favorably, the Bluetoothmodul BTM-222 should regard. For someone that manufacturing, equipment and Parametrieren of the plate does not think itself capable of can I an equipped and examined plate available make. Who does not have a possibility plates manufacture can the plate or get a kit with all necessary components, also without the Wi.232EUR-R module - email to me. ¿Es así de facilito o se me escapa alguna cosilla? Gracias por traernos las novedades alemanas, yo estoy un poco desengachado de ese foro, es un rollo andar traduciendo. En principio parece facil su implementacion, te ponen el cliche de la placa y todo, seria simplemente insolar comprar los componentes y a funcionar, incluso creo que te dan las configuraciones que tenemos que darle al radio modem. Yo no pillaria el kit completo, me pillaria los modulos sueltos y ya esta. El kit ese no tiene mucho sentido para nosotros. Hablan que el bluetooh como va en 2.4ghz interfiere con los equipos de video y de rc en 2.4ghz, por cierto y hablando un poco de todo, el chisme que sacaron la tienda oficial para sacar la pwm de cualquier receptor que tal va? En 2.4ghz u otras frecuencias habeis probado a ver que tal? Creo que lei por ahi que daba algun problema. ...por cierto y hablando un poco de todo, el chisme que sacaron la tienda oficial para sacar la pwm de cualquier receptor que tal va? En 2.4ghz u otras frecuencias habeis probado a ver que tal? Creo que lei por ahi que daba algun problema. Esta por algun lado el listado de componentes smd? Si eso se podria hacer un pedido a farnell entre varios de los componentes smd, + los radiomodems y pedir por otro lado la placa a la tienda alemana. 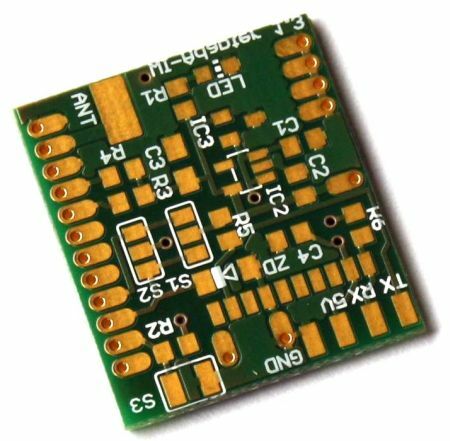 Lo de los componentes smd no te asustes, con una buena lupa un soldador de 10W y solder flux va de maravilla. Por cierto donde va ubicada la antena de los radiomodems que no lo he visto? ¡¡Una cosa menos para hacer jeje!! Jeje, gracias Javierete, aguantate un poco que esto es un vicio!!!!!!!!!! Sin duda es una de las facetas más interesante del Mikrokopter. En un principio no parece difícil montar el circuito, siempre es mas facil de lo que parece. Ahora mismito acabo de comprar uno a espariz . En mi caso se lo pondré a mi X-ufo-BL junto con un receptor Spektrum AR7000 (7-Kanales) 2,4 GHz y a otro Spektrum AR6100e (2.4 GHz / 6 Kanal) .. Según los alcance que obtenga. (Seria bueno que en la tienda, tanto de esta placa, como en el apartado “ReceptorCorona RP8D1 35Mhz EXCLUSIVO PARA MK “ y el DS 4-stop , se hiciese el inciso que es valida también para el X-UFO-BL. El modulo conversor funciona muy bien. Solo tiene un problema que es la documentación en Aleman. En ella hay un punto imprescindible para aquellos que van a utilizar receptores de menos de 8 canales, mi caso con un AR7000. Para que funcione el canal que no se usa debe de conectarse a cualquiera de los canales que si tienen datos, por comodidad al último, Si no el dispositivo da un error continuo y no envia datos. Me costo 4 horas el descubrilo. Por lo demás una maravilla. El uso de este convertidor nos permite programar el failsafe en el receptor y en caso de que tengas un problema de recepcion puedes activar el vuelta a casa sin problemas. Bureno yo he montado un modulo WII232 y en el taller funciona estupendamente, tengo que probarlo en campo a ver que alcance tiene con las antenitas de cable. El mayor problema fue guardar la configuracion sin que se borrara despues de usar un poquito de traductor entendi que para ellos es imprescindible seguir la configuracion y secuencia exacta para grabacion y su posterior lectura ya que de no quitar el jumper o ponerlo cuando corresponde o no graba la configuracion o la vuelve a resetear. Una vez sobrapasado este punto lo demas es plug and play. Algun que otro problema en las diferentes configuraciones de componentes que tienen un poco mezcladas al montar la placa, pero gracias a que publicaron esquemas y demas no tuve demasiados problemas al montarlo. ¿No es mejor usar los xbee? 5) Esamos hablando de 30 o 60$ frente a 192. Creo que puede existir un problema más de interferencias cuando quieras usar el xxxcopter en compañia de otros, si no se piensa en un protocolo que te permita multicast desde el primer momento. Bueno pués acabo de montar los dos Wi232 y los he configurado y he comprobado que la configuración fuese correcta, los he conectado, uno al MKUSB y el otro a la NavCtrl, he puesto el jumper de la MKUSB y he alimentado la FC y la Nav CTrl y no hay forma de conectar. ¿Que prueba puedo hacer para comprobar algo?? ¿ Se enciende el led en los módulos ? , supongo que solo con el mkusb conectarás sin problemas , ¿ que versión de mktool usas ? . A mi me funciona con la ultima "b" en modo "io compatible" igual que el bluetooth . Sí, el led verde se enciende en los dos módulos, está todo el rato encendido. Tengo instalado el MKTools 1.66b, ¿donde puedo modificar lo de io compatible? Las pruebas y configuraciones de los módulosWi232 han sido correctas. Solo me pregunto si tiene que tener diferentes nº en el Network Goup Register, yo he puesto el 66 (como en las explicaciones de la Wiki a los dos) creo que se puede poner cualquier nº pero ha de ser igual en los dos. Cuando conecto un módulo al MKUSB y arranco el MKTools, el led del Tx del MKUSB se pone a lucir a toda velocidad intentando conectar con la NC pero no hay conexión. He repasado todas las soldaduras y sigue igual. Pongo una foto de como están montados. Todos los puentes de unión entre el módulo y la plaquita están soldados. si acristobal tienes los puentes mal, uno los lleva de una forma y el otro de otra, no recuerdo cual es cual de memoria pero tu fallo es ese. Simplemente cambiale a uno los 2 puentes y conectalo al MK el otro es para el MKUSB, ya veras como enlazan. Gracias Hermo, que sería de mí sin ti. Ya está corregido el problema. Estoy preparando un pequeño texto con fotos para mandartelo Alberto y que lo puedas colgar en la wiki. Por cierto Alberto la placa correcta de la versión 1.3 es esta. Estuvé ayer casi una hora hasta que encontré la foto del montaje. Yo esta tarde estoy entretenido soldando los componentes, de momento tenía una duda con los condensadores. Hay dos iguales el C2 y el C4 de100nF y el C1 que es de 1 microF que como va suelto y es mas gordo pues supongo que es ese. Pero en las fotos de raditronix parece que el mas gordo de 1microF era el C4, pero gracias a la foto de acristóbal he visto que el C1 es mas gordo. Bueno voy a ver si termino con el otro y mañana los pruebo. O si me da tiempo hoy, pero no creo. Acabo de montar los dos módulos y no se como configurarlos. Solo he conseguido que se encienda el led verde cuando puenteo el USB. Pero el programa de Radiotronix pone Timeout ocurred-no responding. He probado con 2400 y con 57600. Alguien me podría indicar que pasos debo seguir. Módulo conectado al MK-USB: S1 estarán unidos el pad 2 con el 3, y en S2 estarán unidos el pad 1 con el 2. Módulo conectado a la FC o la NC: S1 estarán unidos el pad 1 con el 2, y en S2 estarán unidos el pad 2 con el 3. Después el condensador C3 con la marca blanca en el contrario a masa. ¡¡¡Seguimos escrupulosamente el orden de los pasos!!! ¡El punto importante es poner el puente el Wi.232 sólo después de que haya electricidad! Ese manual Alberto lo podría colgar en el wiki, esta estupendo. Llevaba casi dos horas haciendo pruebas.... Al final cuando he descubierto que tenia que tener los dos jumpers puestos y se encendía el led verde, solo hacia las pruebas con un módulo y precisamente era el que tenia los puentes S1 y S2 para la Navi-ctrl. He colocado el módulo con el S1 2-3 y el S2 1-2 y voila... ha conectado. Después no me dejaba grabar no podía leer datos pero he probado la opción de resetear y ya me ha dejado introducir todo. Solo he cometido un fallo :redface2: he cortado los cables planos porque lo veía demasiado largos (deben medir unos 6 o 7cm ahora). Mañana lo cambiaré para que mida esos 9 cm. yo pensaba que los 9cm solo era la antena, y no las dos cosas. De todas formas creo que no debe ser muy crítico, como mucho para hacer las pruebas me sirven, en vuelo igual no alcanzan tanto, no se. No me queda claro, a que te refieres. Y la pantalla Volatile Registers, que tiene frecuencias en TX y RX ¿se configuran o es igual? Bueno por ya tengo bastante, mañana me toca cambiar los otros puentes del otro módulo, configurar y probarlo. Después actualizar el receptor LRS, montar el BTS555 y montarlo en el Okto. Está puesto un poco más claro, espero que te ayude. Basicamente los unicos parametros que nos interesan son los no volatiles para que queden siempre grabada nuestra configuracion. Los del Jumper del WII232 funciona asi: si se alimenta con el Jumper puesto se resetean todos los valores a los de fabrica, y tambien es necesario para programar el modulo, de ahi que una vez programado no se vuelva a poner mas que para verificarlo y una vez que ya este alimentado. ahora bien como dice Alberto usar el equipo de DMD junto a estos modulos puede ser un problema. Por eso preguntaba lo de las frecuencias, para intentar separarlas lo máximo posible. De todas formas al tener las tramas en pantalla podré ver si pasa algo. El único problema podría ser perder parte de la señal en el módulo wi232, pero mientras pueda tener un alcance de 500 o 1000mts ya me conformaría. Siempre será mejor que el BT o hacerlo por cable. Ahora si, es lo que habia hecho, desconectarlo todo, volverlo a conectar, y ir pulsando el read para ver si los valores estaban bien. Bueno gracias a la ayuda de todos ya tengo el Mktools 1.66b funcionando con mis dos wi232. No ha sido tan complicado. Enhorabuena a los que ya habéis conseguido que os funcione. Quería haceros una pregunta, ¿a que distancia se consigue comunicar con estos módulos con el cablecito que viene como antena de serie? Si lo vas a volar en automático es casi mejor usar el bt , te sale mas barato y no te interfiere en nada ( con las placas 1,3 había problemas de rf a través de los gyros ) . No esta muy facil por lo que estuve mirando hace tiempo, necesitamos un experto en atmels. La verdad es que no tengo interés en volar demasiado lejos, la gracia del mk es volar cerca de las cosas, para vuelos lejanos el avión da mas juego. He estado probando a alejarlo, dejarlo quieto con el gps y darle a la tecla de vuelta a casa todo en FPV y es una gozada, pero con el bt se me desconecta muy muy cerca, quizás por que uso un vaio mini, y me gustaría tener el mk situado en la foto a un par de centenares de metros. Yo estoy buscando lo mismo, no conseguí hacer funcionar el BT y he montado los módulos WI232. Pero acabo de constatar que los módulos wi232 no van finos con el receptor del DMD. No de quien es la culpa, pero parece que estos módulos se saturan cuando enciendo la emisora. Llevo la última versión en la Flight-Crtl, y la información en el MK-tools parece que va lenta, y a veces no me deja entrar en sentings. el canal 7 sube a tope de vez en cuando, igual es que el receptor entra en failsafe, tendré que conectar el video para ver las tramas. Lo que esta claro que volar con esos módulos es mucho riesgo. En fin que me parece que tendré que hacer las modificaciones por cable. Pero me hacia ilusión poder tener conectado el Okto al PC. Lo único positivo es ahora con el receptor LRS saco la señal pura y limpia por el canal 10 y las "K" del Mk se quedan quietecitas en el 0 sin moverse. Los motores suenan finos sin variaciones. Tengo ganas de probarlo, si con espasmos volaba bien, ahora con todas las señales limpias tendrá que ser una gozada. Yo estuve revisando asi por encima algunos de los archivos donde podria estar metida la limitacion, pero no encontre nada, no estara en el MKtools?? si fuera asi el problema es un poco mas gordo ya que de ese no hay codigo fuente. De todas maneras habria que profundizar mas en el codigo. A ver si esta semana lo dejo todo listo y empiezo a practicar el FPV, ya le tengo ganas ya. animate a probarlo, verás que es sorprendentemente fácil. si crees que puedes tener problemas, dale al vuelta a casa y mantener altura y luego solo tienes que bajarlo quitando gas, pero como te digo, es muy fácil volarlo en fpv sin ayuda. No sé, estoy pensando que igual los cables planos al no ser de 9cm pueden tener algo que ver. Antes de pasarme al BT miraré de aislar un poco los módulos. He mirado por el OSD y al receptor en principio no le afecta, en las tramas. Tendré que probarlo en el exterior con la emisora mas alejada del PC. Lo ideal sería poder encontrar algún tipo de radiomodem con una frecuencia en 433-434 o algo parecido. Hola, se ha currado Acristobal un tutorial muy bueno para el montaje de los Wi232, aqui os lo pongo, muchas gracias Alberto!! Hoy ha sido mis primeros vuelos en FPV con el Oktokopter, he gastado 5 baterías de 4200..... tenias razón has sido fácil y alucinante. No tenia el OSD (esta en el SAT) así que he volado solo con la cámara. El primer vuelo he despegado, en 3a persona para probar los ajustes, lo he clavado a 10mts. de altura delante mio, he dejado la emisora y me he colocado las gafas, ha sido una gozada. Aterrizar es lo que encuentro mas difícil, sin OSD calcular la bajada y la distancia al suelo tenia que recurrir a un compañero para que me dijera la altura o si bajaba muy deprisa, lo he realizado 3 o 4 veces en FPV, pero al final lo paraba cerca y a una altura de seguridad, me quitaba las gafas y aterrizaba. Tienes que ir muy fino cuando se acerca al suelo el sensor es engañado y vuelve a subir. Antes no me costaba tanto aterrizar. El vuelo con el receptor LRS de DMD con la señal directa desde el canal 10, ha sido un acierto, (Gracias Tron ) no he tenido ningún "espaspo" ni en el Okto ni en el servo de la cámara. Ha sido una experiencia alucinante, he volado con la nueva cámara FPV530HD y estoy muy satisfecho. Al final casi se me ha hecho de noche y yo tenia una visión perfecta. No tengo ni vídeo, ni datos de altura máxima que he subido muchísimo mas alto que vuelos anteriores seguro que he sobrepasado los 200mts. He realizado pasadas por encima de la pista a una velocidad considerable. A ver si el viernes me llega el OSD y puedo estrenar la cámara de fotos. .......... A ver si el viernes me llega el OSD y puedo estrenar la cámara de fotos. enhorabuena por el estreno , es alucinante volar el bicho en fpv, una vez que le cojas el tranquillo verás que es fácil aterrizar en fpv.